I first saw this in a camcorder knob and later saw it in a DSLR screen. .
Why add tint control to a camera and merge it with WB knob? A daunting task, because humans see using an eye/brain combination that alters our visualization of the world. This mechanism is eye independent. Try this experiment. Procure some transparent color filters, cellophane (candy wrappers work nicely). Filter one eye only with a deep red filter. Keep the filter in place for about 2 minutes. Remove the filter and then peer about quickly looking with one eye, then the other. You will find that the filter eye has radically changed as to its color balance. That eye will see the world with a blue-green tint. Try this again with yellow or blue or green cellophane. Each filter rapidly alters the filtered eye color balance. This adaptive mechanism occurs every minute of every day, to both eyes. You will be witnessing the human ability to adapt and normalize when the ambient light is off-color. With some minor exceptions (special color films) color photography had to wait till the advent of electronic imaging. Now we have “white balance”, a camera mechanism that attempts to mimic our ability to adapt to light source alterations. Photography adopted color “temperature”. Scientist verified that blacksmiths, glazers, potters and other workers (smiths) were able to regulate the temperatures of the materials of their craft visually by color changes as the material is heated. Seems all materials glow with alike outputs as they are heated to incandescence. Black red 426°C --- Dark red 593°C – Cherry red 815°C – Yellow 1093°C – White 1315°+ etc. Now physicists prefer the Celsius scale and they respect an adaptation known as the Absolute Scale. This is the Celsius scale with zero set to -273°C. This is the rock-bottom temperature so starting zero at this value avoids the possibility of negative temperatures. The champion of Absolute scale was William Thomson, 1st Baron Kelvin. In his honor, the Absolute scale was renamed Kelvin scale. 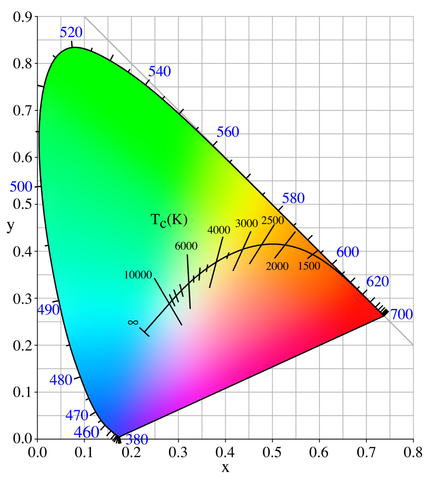 Color films and now digital imaging and light sources are typically categorized using the Kelvin scale. Candle 1850K – Standard 60W tungsten lamp 2400K – Studio tungsten bulb 3200K -- Daylight 5500K. Images taken under various lighting conditions often yield results that are not faithful reproduction. The traditional countermeasure was to mount a color correction optical filter before the lens. These are shades of blue to reverse reddish ambient light from tungsten sources and salmon (pink-amber) to neutralize the excessive bluish tints of north-sky daylight. Digital settings to correct off color lighting conditions are warming or cooling offsets. White balance works on a color temperature scale, which adjusts color on a blue-orange spectrum. Green-magenta has to be adjusted separately because the color temperature adjustments don't really affect it. In the diagram, note that green-magenta is more-or-less orthogonal to the color-temperature curve. Not the answer you're looking for? Browse other questions tagged color white-balance color-correction or ask your own question. Why does Adobe Camera Raw 6.4.1 offer different White Balance for different photos? How does white-balance synchronisation work in Lightroom? Why do I have a purple tint on black lines on white backround? Why are the colors so different in these two photos from different cameras even though I set white balance to the same temperature in Lightroom? Why do we actually need to adjust white balance? Why does my 6D create greenish images with a high temperature white balance setting? Does the d7000 have a problem with green tones? Relationship between tint-temp and magenta-green-blue-amber white balance corrections?